As well as giving lucky South Africans the chance to win a huge payout, the South African lotto is best known for its fantastic odds and exhilarating additional games (Lotto+1 or Lotto+2). But you don't need to go all the way to Jo'burg for a jumbo jackpot! 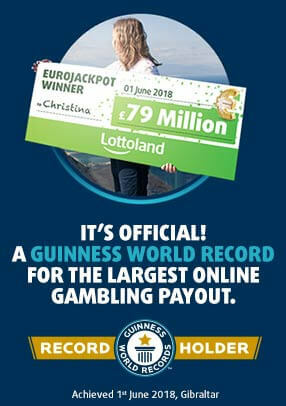 UK players can now bet on this fantastic lotto right here at Lottoland! This exciting draw takes place twice a week on Wednesday and Saturday evenings. Bets close at 7:30pm BST and the draw takes place few minutes before 8pm BST. Simple! Just pick six numbers from a pool of 1 to 52. Any of the Lotto, Lotto+1 or Lotto+2 jackpots can be won by matching all six main numbers. How much can I win and what are the odds? What are the chances of winning the jackpot? The DoubleJackpot feature allows you to bet for twice the jackpot. For example, if the main jackpot was £790,000, if you activated the DoubleJackpot feature you could potentially win £1,580,000. The DoubleJackpot feature is also available for the Lotto+1 and Lotto+2 jackpots. You will pay double the price of your normal bet to activate the DoubleJackpot feature. If your account has been verified simply proceed to your account and withdraw your winnings. If your account has not been verified, you will first need to provide proof of your ID and proof of address. Once this has been confirmed you will be able to withdraw your winnings. Winners will receive an e-mail confirmation. Any person who wins a sum of over 10,000 rand (approx. £869) will receive a phone call informing them and congratulating them on their win. The subscription feature allows you to set up a running line or lines for a given lottery draw. Lottery subscriptions will save you time and ensure that you never miss your chance to win that big jackpot. Just select the subscription option prior to purchasing your line to set up your running line/s. You can cancel your subscription at any time.